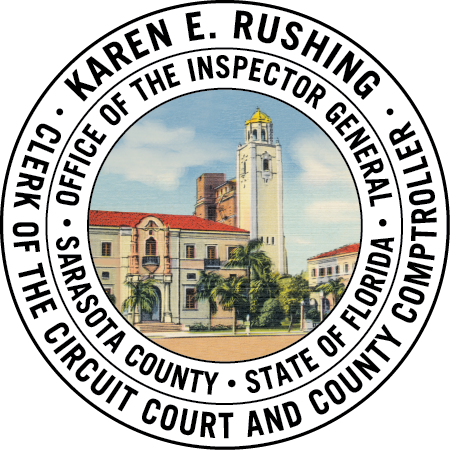 This website is maintained by the Sarasota County Clerk of the Circuit Court (the "Clerk") and is provided to the public free of charge. While the Clerk uses its best efforts to maintain this website and to provide accurate and current information, the Clerk makes no representations, guarantees, or warranties with respect to this website's information or content as viewed or accessed using computer hardware or software that is not controlled or maintained by the Clerk. Accordingly, the Clerk is not responsible for any defects, inaccuracies, misinformation, or damages of any kind, specifically including consequential damages, arising from the use or access of this website's information using computer hardware or software that is not controlled or maintained by the Clerk.